To describe Paterson, the new film by Jim Jarmusch, is to risk making it sound both cutesy and condescending. Adam Driver, gangly millennial prince, plays Paterson from Paterson, New Jersey, a bus driver who moonlights as a poet. If the wordplay of that setup doesn’t make you gag (even the casting is a pun), there’s the implied novelty of the premise: Is it really so unusual, the idea that the dude manning the wheel of public transportation could be (gasp!) a creative person? And yet for all the warning flags its log line throws up, Paterson turns out to be something really special: a sublimely mellow comedy about everyday life. And that’s because Jarmusch, that aging ambassador of cool, sincerely respects both the the ordinariness and the artistry of his blue-collar hero. One does not contradict the other. They are intimately related. Structured a bit like a poem itself, with rhymes and repetitions, Paterson unfolds over a single, uneventful week in the life of its title character, nearly every day beginning the same way, with a static, overhead shot of Paterson curled up in bed. After stirring naturally from his slumber, he will walk to work; drive the bus for a few hours; walk back home; have dinner with his girlfriend, Laura (Iranian actor Golshifteh Farahani), with whom he lives; take their noisy, needy English bulldog for a walk; and stop in for a nightcap at his local watering hole, the kind of neighborhood bar whose sign reads only “Bar.” Sometime during the day, on his lunch break or in the few minutes before starting work, he’ll jot down a few words in his notebook, expending these sporadic units of spare time on his writing. He seems to treat poetry as more of a hobby than a calling, except that he does it often and has a real knack for it. Driver reads Paterson’s poems aloud—haltingly, as if writing them—and they’re scrawled right across the screen, developing and evolving before our eyes, a series of simple observations gaining new meaning as he refines the language and weaves in evocative turns of phrase. But Paterson does more than just make us privy to works in process; it also aligns the audience’s perspective with Paterson’s, tuning us to his creative wavelength. As it becomes clear, every passenger, every overhead conversation, every interesting detail the man encounters is a potential source of inspiration. Jarmusch uses insert shots—of matchbooks, of shoes, of a half-empty glass of beer (Paterson would probably call it half full)—to express how the character looks at the world. Visual motifs, like the reoccurring appearance of twins, serve the same function: They suggest how Paterson, a diligent observer, detects patterns and draws connections. So, too, do the film’s surfeit of playful running jokes, including a gag involving a crooked mailbox that has an incredible payoff. For all the time its protagonist spends alone, deep in thought, Paterson also doubles as a sweet, pragmatic love story. Laura, our hero’s better half, is an artist, too, and Jarmusch finds good-natured comedy in her constant pivots to new pursuits—baking, painting, and guitar playing, just over the course of this one depicted week—without turning her into a source of ridicule. Part of that is Farahani, who makes Laura a beacon of warmth and loopy positivity, and part of it is Driver, who conveys a deep, comfortable affection for her foibles. But it’s also the way Jarmusch paints the two of them as fundamentally compatible in their differences: Just as he respects her penchant for reinvention, she accepts him as a creature of habit, married to his daily and nightly rituals, like that walk to the bar. The film’s understanding of cohabitation and longterm partnership marks it a companion piece, of sorts, to Jarmusch’s last movie, Only Lovers Left Alive, which similarly acknowledged the need for people in relationships to spend time apart and nurture their separate interests. There’s so much wisdom and humor packed into every square inch of Paterson, even as the film’s pace remains a relaxed stroll. It’s the kind of movie that turns “nothing happening” into a selling point and a worldview. (The one moment of overt “excitement,” which operates as the climax of a subplot involving Paterson’s fellow bar patrons, is resolved with amusing speed.) The movie rests largely on the shoulders of its lanky lead. In the years since Girls made him an unlikely star, Driver has built quite the résumé of motormouthed hipster jerk-offs. Paterson, who won’t carry a cellphone or even make photo copies of his poems, could be accused on paper of crawling from the same retro-fetish gene pool that spawned his character in Noah Baumbach’s While We’re Young. But the actor dissipates any trace of holier-than-thou pretension by softening his abrasive charisma into a gentle curiosity. 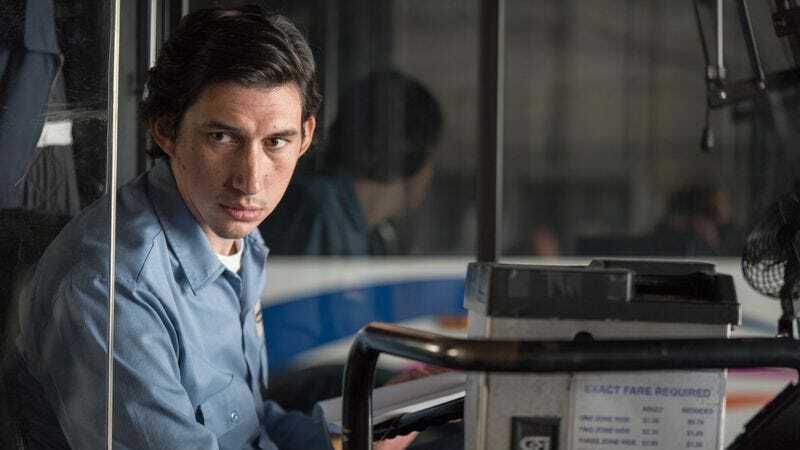 Paterson has, to torture the cliché, the soul of a poet, and Driver—in his richest and most understated performance—keeps finding grace notes in the character’s low-key temperament. For Jarmusch, the American scenester poet who made Dead Man and Down By Law, this feels like a high point: the profoundly unhurried slice-of-life he’s been working toward his entire career. The writer-director has a habit, sometimes detrimental, of turning his movies into elaborate tributes to his own impeccable taste, often populating them with the rock stars and other famous people he knows. Paterson isn’t totally free of cameos or celebrity cachet; Method Man shows up for one scene, spitting rhythms at the laundromat as an aspiring emcee, and the film also quietly arranges a Moonrise Kingdom reunion, as a kind of communion with a kindred spirit of American deadpan. But most of the famous faces that appear are plastered on the wall of Paterson’s favorite dive, as part of the hometown-heroes shrine Doc (Barry Shabaka Henley) has assembled to celebrate their city’s biggest alums. For the most part, Jarmusch casts character actors, bit players, and unknowns, the better to match the anywhere-U.S.A. vibe of Paterson, New Jersey, which the director never attempts to make look more glamorous, exciting, or exotic than it is. He embraces its normalcy.